LOS ANGELES — Billionaire Elon Musk debuted a long-awaited test tunnel on Tuesday to demonstrate technology that he said could revolutionize transportation in what is often called the most freeway-congested city in the nation. The less than 2-mile tunnel took VIPs and journalists on rides in a Tesla electric vehicle with horizontal wheels added to the chassis in order to keep the vehicle aligned on a track. While riders were taken at speeds of about 50 to 60 miles per hour, Musk said the tunnel would ultimately be good for speeds of 150. The idea would be to use driverless vehicles to make the trip in the quiet and comfort of the underworld. The tunnel has been nearly two years in the making — it was initially approved by state officials as a subterranean walkway — and was the brainchild of Musk after he complained in 2016 about his "soul-crushing" commute from Bel Air to his rocket company SpaceX in Hawthorne. The Loop system from his adjacent Boring Company startup, once up and running, would take vehicles underground on an elevator and then send them zipping along a track to their destination. An earlier concept of public-transportation-like "skates" based on Tesla chassis was abandoned, apparently, in favor of regular Teslas with the enhanced wheels. Those who tried the tunnel described a very bumpy ride at less than optimum speeds. During a presentation, Musk called his project "a little rough around the edges." But he continued to make big promises, even as another planned tunnel near the dreaded 405 freeway was recently nixed as part of a settlement with neighborhood groups that sued the city for fast-tracking its environmental review process. 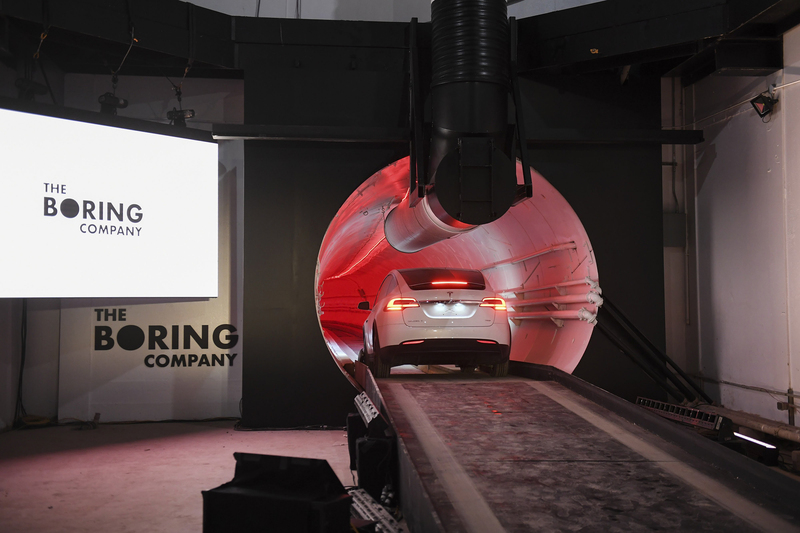 Musk said Boring's technology will eventually be able to dig tunnels 15 times faster than contemporary methods. Musk's demonstration Tuesday included the entrepreneur's usual trappings for an unveiling, like nightclub-style lighting and music, but it left many questions remaining, including how a one- or even two-way tunnel of that size would alleviate much traffic in Los Angeles, where about 20,000 vehicles per hour pass the Boring Company in Hawthorne along the 405 freeway, according to California Department of Transportation data. Also, the tunnel's width, and the Tesla's use of horizontal wheels that tuck under the vehicle, appeared specific to Musk's own automaker. And the elevators used could create choke points that simply mean more traffic, experts have said. "New capacity has never helped with congestion and never will," said James Elliott Moore II, director of the Transportation Engineering Program at the University of Southern California. The professor said congestion pricing — charging commuters according to the density of traffic — is the only way to solve the problem Musk is tackling. "If his real goal is to reduce congestion, I would say focusing on a way to make it simple to assess congestion tolls would move ahead further than boring tunnels," he said. Boring Company has loosely proposed a network of tunnels beneath Los Angeles — it's not clear if public money would be involved — and his Dugout Loop plan to bring baseball fans to Dodger Stadium via a tunnel funded privately is in the environmental review stage.